As the digital photo phenomenon continues to expand like a red dwarf imploding, Apple has added a plethora of new advanced features to one of their most accessible photo manipulation software packages, Aperture 3. And unlike the relatively simplistic iPhoto '09 or the powerful yet overtly complicated Adobe Photoshop, Aperture 3 sits neatly in the middle of these packages but best of all, it's affordably priced at $249 or $119AUD for the upgrade. 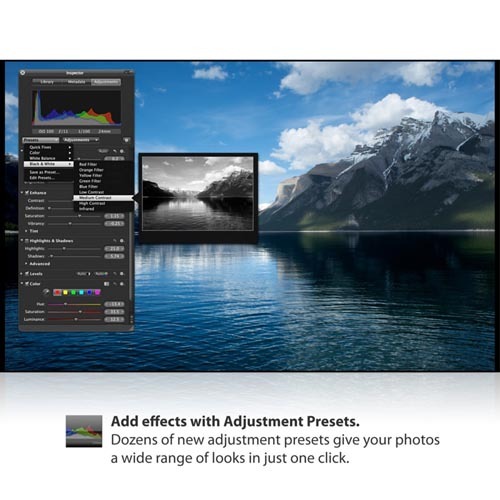 As per all good Apple software, in keeping things accessible to users, Apple have endeavoured to keep the interface relatively easy to use and if you’re familiar with iPhoto ’09, than the learning curve of this package will be relatively low. As this software is quite powerful, we've tried to highlight the best aspects of this software and when in doubt, why not download the 30-day trial from Apple. With that said, whether you're a novice, amateur or to some extent a professional digital photographer, this all in one program offers users a plethora of features from editing photos, cataloguing and even uploading photos to popular social networking sites such as FaceBook. For us, the most impressive functionality of Aperture 3 is the inclusion of over 200 new features that cover a wide gamut of managing your digital photos such as full screen support and Faces which allows you to categorise photos based on particular people. Very impressive indeed. The installation process of Aperture 3 was a very pain free experience and once installed, we were ready to jump straight into the program. However it should be noted that the minimum system requirements of this program include a Mac Pro or greater and OS X v10.5.8 and greater. 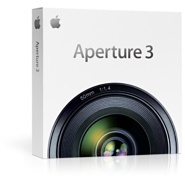 And for those with 64-bit processors, Aperture 3 also supports this. 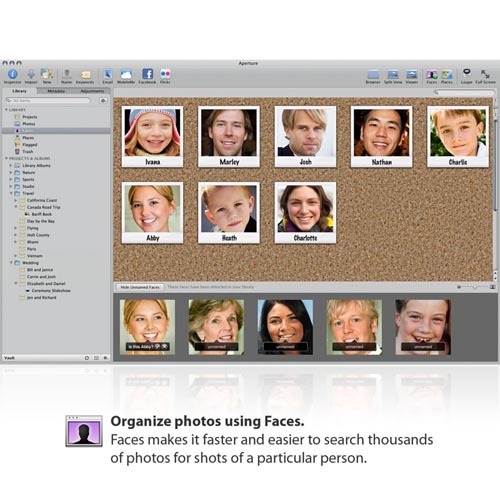 Faces is a strong addition to this software package and through the advanced face recognition algorithms, it makes cataloguing photos of certain people are a breeze. We did experience some difficulties with certain angles but the majority of the time, it worked quite well. This aspect of the program needs to be trained and by accessing the Faces option in Aperture, it will display the unnamed photos. Once you assign a name to a photo like Brooke, it will search through photos for similar faces that you can assign or reject. For lovers of FaceBook, names are then converted to name tags when published. The ability to work as a full-screen browser is a great tool for the user which allows you to add labels and sort your photos for example. You can load the photo in this view too but what we found impressive was the ability to double click on the photo and it automatically loaded full screen. It was also lightning fast. Similar to Faces, Places is another powerful cataloguing utility that although won’t provide most users with true functionality but if you own a GPS-enabled camera, it uses these coordinates to sort your photos such as the Royal Melbourne Botanical Gardens. Although this may seem like a thing of the future, the Apple iPhone does support this technology and it’s great to see Apple on the forefront of technology. Thankfully, Places can still be used to categorise photos without the need for this technology as well which is done my dragging the photos onto a map. Slideshows are now integrated into Aperture 3 and offers some fun and professional looking themes for you to choose. You can add background colours, text and even special effects to these themes. These can then be converted to QuickTime and be shared via a variety of devices. But Aperture 3 is not all about images as it even supports HD video clips with basic video editing and the ability to extract still images from clips. Aperture 3 makes editing photos quote accessible and whether you’re removing red eye, increasing the contrast of a photo or even using brushes such as Skin Smoothing to remove lines. I found the scope of this program a little intimidating at first but because it’s so manageable, these fears were unfounded. In relation to brushes, the program offers non-destructible editing which gives a greater amount of freedom to users. This of course works better on RAW files. Brushes, brushes and more brushes. Aperture 3 offers the users a variety of new brushes, including non-destructible brushes. Brushes are quite easy to use, simply select the brush menu and select one of the many brushes. Whether you’re trying to make some surreal images with a brush overlay or smoothing someone’s skin with blur, the quick brushes are the perfect solution for this process and are quite easy to use. If someone is intending in purchasing Aperture 3, make sure you give yourself some time to explore the program because if you’re only using a fraction of this software, than you’re not doing your photos some injustice. Presets are another option as opposed to brushes that allows you to edit your photos such as creating sepia images or some other bizarre photo effects, just select the preset and presto. However, rather than automatically run the preset on the image (like some other companies), Aperture 3 offers a live preview mode that appears as a small pop-up window which improves productivity and give you a great insight into how the photo will look. These are just some of the highlights we discovered in version 3 of Aperture which is one of the easiest programs that we had the pleasure of using. In conclusion, we could happily recommend Aperture to a variety of different users of digital cameras from novice to amateur and even those who occasionally dabble. 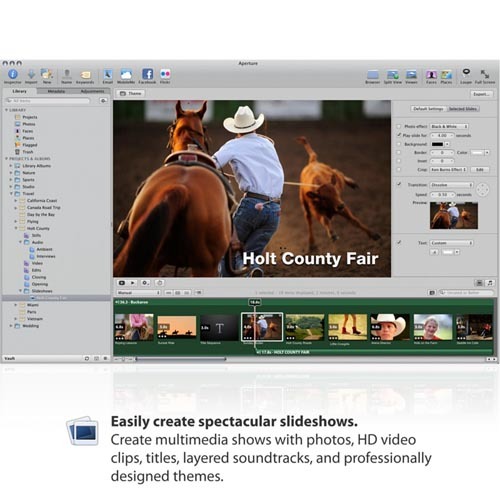 With some great features such as full screen and Places, if you're still a little apprehensive as to the quality of this software package, then why not try the free 30-day trial at Apple and witness for yourself the abilities of this program. Recommended!